For the film, see Moose Jaws. “Canada’s Most Notorious City”, "The Jaw", "Band City", "Little Chicago"
Cree and Assiniboine people used the Moose Jaw area as a winter encampment. The Missouri Coteau sheltered the valley and gave it warm breezes. The narrow river crossing and abundance of water and game made it a good location for settlement. Traditional native fur traders and Métis buffalo hunters created the first permanent settlement at a place called "the turn", at present-day Kingsway Park. The confluence of the Moose Jaw River and Thunder Creek was chosen and registered in 1881 as a site for a division point for the Canadian Pacific Railway, whose construction was significant in the Confederation of Canada. The water supply there was significant for steam locomotives. Settlement began there in 1882 and the city was incorporated in 1903. The railways played an important role in the early development of Moose Jaw, with the city having both a Canadian Pacific Railway Station and a Canadian National Railway Station. A dam was built on the river in 1883 to create a year-round water supply. The area surrounding Moose Jaw has a high number of cloudless days, making it a good site for training pilots. The Royal Canadian Air Force under the British Commonwealth Air Training Plan established RCAF Station Moose Jaw in 1940. Following the war, the RCAF remained in the community and used the facility for training pilots through the Cold War. The facility changed its name to CFB Moose Jaw in 1968 and it is currently Canada's primary military flight training centre and the home of 431 (Air Demonstration) Squadron (aka the "Snowbirds"). CFB Moose Jaw's primary lodger unit is "15 Wing". In the Canadian Forces Air Command, the lodger unit is frequently referred to as 15 Wing Moose Jaw. The base usually holds an Armed Forces Day each year. The Saskatchewan Dragoons are a reserve armoured regiment with an armoury in the city's north end. Moose Jaw has been visited by many members of the Royal Family. Edward, Prince of Wales, who owned a ranch in Pekisko, Alberta, visited in 1919, 1924, and 1927. Prince Albert, future king and father of Queen Elizabeth II, paid a visit in 1926. King George VI and his wife Queen Elizabeth (later known as Queen Elizabeth, the Queen Mother) visited during the Royal tour in 1939. Queen Elizabeth II first visited in 1959, and has come to the city a few times since. Moose Jaw's climate is transitional between semiarid and humid continental (Köppen BSk and Dfb, respectively) Moose Jaw's winters are long, cold and dry, while its summers are short, but very warm and relatively wet. The coldest month is January, with a mean temperature of −12 °C (10 °F), while the warmest is July, with a mean temperature of 19.3 °C (66.7 °F). The driest month is February, in which an average of 11 millimetres (0.43 in) of precipitation falls, while the wettest month is July, which brings an average of 63 millimetres (2.5 in). Annual average precipitation is 365 millimetres (14.4 in). The highest temperature ever recorded in Moose Jaw was 43.3 °C (110 °F) on 5 July 1937. The coldest temperature ever recorded was −47.8 °C (−54 °F) on 4 February 1907. Moose Jaw City Council consists of an elected mayor and 6 city councilors. From 1881 to 1903 the community was represented by a Town Council and thereafter by City Council. Provincially the city is represented by two MLA and federally by one MP. These neighbourhoods are divided into four community associations: South Hill, East Side, North West and Sunningdale/VLA/West Park. Moose Jaw's population was 33,274 according to the 2011 census, which showed a very small increase (3.6%) from 2006. Moose Jaw is a city of 33,000 at the intersection of the Trans Canada Highway and Highway 2. A Snowbird aerobatic jet and Mac the Moose are large roadside attractions of Moose Jaw on the #1 highway at the tourist info center. Moose Jaw Trolley Company (1912) is still offering trolley tours of Moose Jaw. Temple Garden's Mineral Spa, Tunnels of Moose Jaw, and History of Transportation Western Development Museum. are major sites of interest of this city. The juncture of Moose Jaw and Thunder Creek produced the best source of water for steam engines, and Moose Jaw became the CPR divisional point. Large capacity concrete grain terminals are replacing the smaller grain elevators which were numerous along the highway, sentinels of most communities along the route. Improved technology for harvest, transport and road construction have made the large inland terminals more viable economically. The rural governing body around Moose Jaw is Moose Jaw No. 161 which serves 1,228 residents (2006 census) which includes the Moose Jaw, Canadian Forces Base. Meat-processing plants, salt, potash, urea fertilizer, anhydrous ammonia and ethanol producers abound in this area with easy transport access to the Trans–Canada Highway. The Town 'N' Country Mall is the only indoor shopping centre in Moose Jaw. Many retailers and grocery stores operate in Moose Jaw. These include Federated Co-operatives, Safeway Inc., Giant Tiger, Canadian Tire, Real Canadian Superstore, Walmart Canada, Staples, The Brick, Rona, McKarr's Furniture, Peavey Mart, Shoppers Drug Mart, PartSource, Mark's Work Warehouse, Your Dollar Store With More, Dollar Tree, Home Hardware, Castle Building Centres Group and Westrum Lumber. The fourth Army & Navy Stores store in Canada operated on Main Street from 1933 to 2000. Beaver Lumber had a location on High Street until the company was bought by Home Hardware and the store was converted to Castle Building Centre. In 1917, a group of local residents banded together and purchased enough automobile parts to build 25 cars. These were to be manufactured under the name Moose Jaw Standard. Each member of the group was able to receive a car, but no further buyers were found, and production did not continue. The Moose Jaw Art Guild is a community arts association made up of local artists dedicated to exhibiting, educating and fostering appreciation for visual arts. Moose Jaw is home to one of four Saskatchewan Western Development Museums. The Moose Jaw SWDM museum specializes in the history of transportation and has a Snowbirds gallery. The Sukanen Ship Pioneer Village and Museum is south of Moose Jaw on Sk Hwy 2. The car club at Moose Jaw agreed to the restoration of Tom Sukanen's ship at their museum site. Tom Sukanen was a Finnish homesteader who settled near Birsay and hoped to travel home again on his ship he assembled near the South Saskatchewan River. The Sukanen Ship Pioneer Village and Museum features a typical village replete with pioneer artifacts and tractors, cars and trucks restored by the Moose Jaw car club, and is run by volunteers. Tourist attractions include the Tunnels of Moose Jaw, The Moose Jaw Trolley, the Temple Gardens Mineral Spa Resort, The Western Development Museum, Casino Moose Jaw, Moose Jaw Museum and Art Gallery, Yvette Moore Art Gallery, the Murals of Moose Jaw as well as a historic and beautiful downtown. Every July, the four-day Saskatchewan Festival of Words showcases top Canadian writers in a wide variety of genres. The weekend after Canada Day, the free 3 day open air market type Sidewalk Days Festival draws tens of thousands to Main Street. The Snowbirds flight demonstration team is based at CFB Moose Jaw, south of Moose Jaw in Bushell Park, where the now defunct airshow was performed from every summer. It will be brought back for 2019. There are many parks in Moose Jaw. Crescent Park is located downtown and features a creek, picnic tables, library, art museum, playground, outdoor swimming pool, water park, gymnasium, tennis court, lawn bowling field and an amphitheatre. Casino Moose Jaw and Temple Gardens Mineral Spa are across Fairford St. E. and 1st Ave. NE. from Crescent Park. "Wakamow Park" follows the Moose Jaw River and features both natural and maintained areas. There are many trails throughout the park for hiking and cycling as well as picnic tables, barbecues, a burger restaurant and two playgrounds. There is also an RV park, known as River Park Campground, which was founded in 1927 and is the longest-running campground in North America. Canoe and kayak rentals are available across the road from the campground. There is also the Moose Jaw Canoe and Kayak Club for mostly residents of the city, but visitors are allowed too, the club has been around since the late '90s and has been growing since. Its location is inside the campground itself. Old Wives Lake, a saline lake is 30 km southwest of the city on Highway 363. Buffalo Pound Lake a eutrophic prairie lake is 28 km north on Highway 2 and is the city's water supply. Buffalo Pound Provincial Park is on the south shore and can be accessed by Highway 202 and Highway 301. 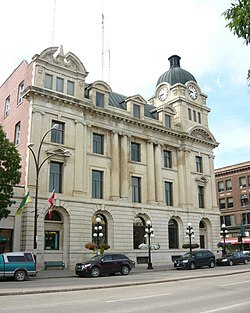 A network of underground tunnels connecting buildings in downtown Moose Jaw was constructed beginning around 1908. They were originally built as an underground steam system that was abandoned. The tunnels were used to hide Chinese railway workers escaping persecution during the Yellow Peril or unable to pay the government-imposed head tax. Entire families lived in the tunnels and worked at above-ground businesses in exchange for food and supplies. The tunnels became a hub of renewed activity in the 1920s for rum-running during Prohibition in the United States. They were reported to have warehoused illegal alcohol that was then shipped to the U.S. via the Soo Line Railroad. The tunnels were also used for gambling and prostitution, all without interference from the corrupt police chief. There has long been anecdotal evidence American mobster Al Capone had visited Moose Jaw or had interests in the bootlegging operations. Although no written or photographic proof exists of Capone's presence, several firsthand accounts from people in Moose Jaw who claim to have met him have been documented. Capone's grandniece also confirmed he had been in Moose Jaw prior to his 1931 conviction for tax evasion. In the 21st century, the city capitalized on this notoriety to restore the tunnel network into the Tunnels of Moose Jaw, a tourist attraction that opened in June 2000. Like most Canadian cities, hockey has played a large part of Moose Jaw's sporting culture, yet baseball has also been an important part of Moose Jaw since its first days as the city won territorial championships in 1895. Most recently, the 2004 Junior All-Star team (age 13/14) won the Canadian Championship and became the first team from Saskatchewan to win a game at the Little League World Series. Local institutions include 5 high schools and 15 elementary schools. The schools are in the Prairie South School Division and the Holy Trinity Catholic Schools. École Ducharme offers preschool to grade 12 and is the only Francophone school in Moose Jaw. École fransaskoise de Moose Jaw offers French Immersion from preschool to grade 9. Moose Jaw is also home to the Moose Jaw Campus of the Saskatchewan Polytechnic. Moose Jaw Union Hospital, part of the Five Hills Health Region, was the main health care provider for the city since 1948, but it closed in 2015 and replaced with Dr. F.H. Wigmore Regional Hospital in the city's northeast end. The new location was picked in part due to its close proximity to the Trans-Canada Highway. The Wigmore Hospital uses LEAN methodology to save time and money in healthcare. The Moose Jaw Fire Department (est 1906) is a fifty-seven member fire and rescue service which provides fire suppression to the city and CFB Moose Jaw. It has 2 stations (North Hill Fire Station (Headquarters) and South Hill Fire Station. It is also contracted out to CFB Moose Jaw to provide structural fire suppression services. Ambulatory (EMS) services is provided by Five Hills Health Region which operates an EMS station in Moose Jaw and non-emergency services are provided by St. John Ambulance. The Moose Jaw Police Service provide policing with fifty-four sworn members for the city and hold both municipal and provincial jurisdiction, and is in partnership with the Royal Canadian Mounted Police. Moose Jaw Transit provides local bus service to urban areas of the city. This small system operates four routes from a downtown hub on weekdays between 7:15am and 9:45pm and on Saturdays from 7:15am to 6:15pm, with no Sunday or holiday service. The entire bus fleet was replaced in 2008 by new low floor accessible vehicles, under the federal government's one-time public transit capital funding program. Moose Jaw Municipal Airport is 7 nautical miles (13 km; 8.1 mi) east-northeast of Moose Jaw. CFB Moose Jaw's airfield is also used by civilian aircraft, with civilian operations at the base referring to the facility as Moose Jaw/Air Vice Marshal C.M. McEwen Airport. The only television station local to Moose Jaw is CKMJ-TV channel 7, an analogue repeater of CTV station CKCK-DT Regina. Moose Jaw was previously served by CHAB-TV, a television station that existed from 1959 to 1969. In the Series pilot for Due South, it is revealed that the character Benton Fraser once worked in Moose Jaw. Roger Carter, former Dean of the University of Saskatchewan College of Law; born in Moose Jaw. Ross Thatcher, former Premier Province of Saskatchewan (1964–1971). ^ "Saskatchewan slang". canada.com. Postmedia Network Inc. 7 November 2007. Archived from the original on 9 November 2012. Retrieved 21 December 2013. ^ "Tagline defies definition - Living - The Moose Jaw Times Herald". Mjtimes.sk.ca. 1 April 2009. Archived from the original on 10 February 2018. Retrieved 10 February 2016. ^ "Moose Jaw, Saskatchewan on". Transcanadahighway.com. Retrieved 10 February 2016. ^ "Census 2016: Prince Albert, Moose Jaw population growth below national average". ^ "Census Profile, 2016 Census — Moose Jaw, City [Census subdivision], Saskatchenwan and Nunavut [Territory]". Retrieved 15 January 2018. ^ "Moose Jaw population growth fell behind national rate, census shows". 8 February 2017. ^ "2016 Official Municipal Election Results" (PDF). ^ "CBC.ca - Canadian News Sports Entertainment Kids Docs Radio TV". www.cbc.ca. ^ "639 area code rolling out well in Saskatchewan, but some annoyed". 1 August 2015. ^ "Early History". City of Moose Jaw. Retrieved 19 August 2013. ^ Larsen, John; Maurice Richard Libby (2001). Moose Jaw: people, places, history. Coteau Books. p. 10. ISBN 9781550501636. ^ "Daily Data Report for July 1937". Environment Canada. 22 September 2015. Retrieved 25 June 2016. ^ "Daily Data Report for February 1907". Environment Canada. 22 September 2015. Retrieved 25 June 2016. ^ "Moose Jaw A". Canadian Climate Normals 1981–2010. Environment Canada. Retrieved 14 May 2014. ^ "Moose Jaw CHAB". Canadian Climate Data. Environment Canada. Retrieved 29 April 2016. ^ "November 1999". Canadian Climate Data. Environment Canada. Retrieved 25 June 2016. ^ "Moose Jaw CS". Canadian Climate Data. Environment Canada. Retrieved 12 August 2018. ^ "Mayor & Council". 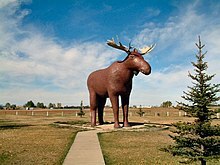 Tourismmoosejaw.ca. Retrieved 10 February 2016. ^ "Recreation - City of Moose Jaw". 17 October 2011. ^ "2011 Community Profiles". 2011 Canadian Census. Statistics Canada. 5 July 2013. Retrieved 20 May 2012. ^ "2006 Community Profiles". 2006 Canadian Census. Statistics Canada. 30 March 2011. Retrieved 10 May 2011. ^ "NHS Profile, Moose Jaw, CY, Saskatchewan, 2011 (The sum of the ancestries in this table is greater than the total population estimate because a person may report more than one ancestry (ethnic origin) in the National Household Survey.)". 2011. Retrieved 14 June 2014. ^ a b "2006 Community Profiles". Statistics Canada. Government of Canada. 2006. Retrieved 26 December 2007. ^ Solonyka, Ed (1998–2006). "Large Roadside Attractions". Archived from the original on 8 January 2008. Retrieved 29 December 2007. ^ "Temple Gardens Mineral Spa". Retrieved 15 April 2008. ^ "Tunnels of Moose Jaw Home Page". Retrieved 15 April 2008. ^ "Moose Jaw WDM". Retrieved 15 April 2008. ^ Government of Saskatchewan. "Sask Biz Moose Jaw". Retrieved 12 August 2007. ^ Government of Saskatchewan. "Sask Biz Moose Jaw (No.161)". Retrieved 12 August 2007. ^ "Inland Container Terminal Analysis, Final Report - December 12, 2006" (PDF). Retrieved 15 April 2008. ^ Government of Saskatchewan. "Sask Biz Pense No. 16". Retrieved 12 August 2007. ^ Squareflo.com. "Saskatchewan NAC". www.sknac.ca. Retrieved 7 March 2017. ^ "Moose Jaw Western Development Museum". Retrieved 9 September 2009. ^ "Sukanen Ship Pioneer Village and Museum". Retrieved 9 September 2009. ^ Beuckert, Dennis (12 January 2000). "Moose Jaw tunnels reveal dark tales of Canada's past". The Globe and Mail. Retrieved 19 August 2013. ^ Yanko, Dave. "Engaging History". Virtual Saskatchewan. Retrieved 19 August 2013. ^ Cowan, Pamela (19 August 2013). "Finding Al Capone's Sask. connection". Leader-Post. Postmedia Network. Retrieved 19 August 2013. ^ "Attraction History". Tunnels of Moose Jaw. Retrieved 19 August 2013. ^ "Moose Jaw getting new hospital - Saskatchewan - CBC News". Cbc.ca. 30 August 2011. Retrieved 10 February 2016. ^ "Moose Jaw EMS". Fhhr.ca. Retrieved 10 February 2016. ^ "Scott Deibert". justsportsstats.com. Retrieved 13 November 2015. ^ Climate data was recorded at Moose Jaw CHAB from March 1894 to May 1954, and at CFB Moose Jaw from January 1943 to present. 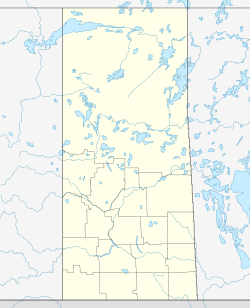 Wikimedia Commons has media related to Moose Jaw, Saskatchewan.